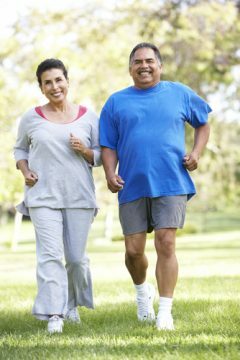 Summertime is a great time to develop a regular outdoor exercise routine; the sun is shining more often, and there is typically less rain. Furthermore, adding an outdoor exercise routine to your schedule gives you a change of scenery, an opportunity to defeat workout boredom, and the ability to increase the intensity of your workout organically due to natural changes in the earth’s terrain. 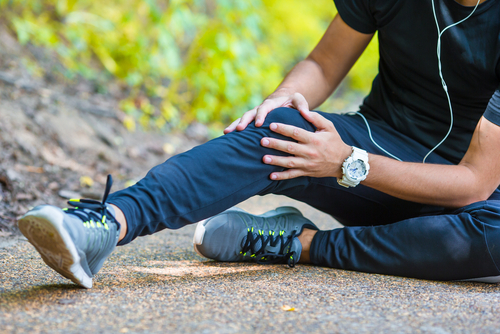 However, exercising in summer hot weather comes with its own unique set of challenges that you should pay close attention to next time you’re preparing to head outside for a run, bike, or whatever your favorite outdoor routine may be. Otherwise, serious heat-related injuries can occur. 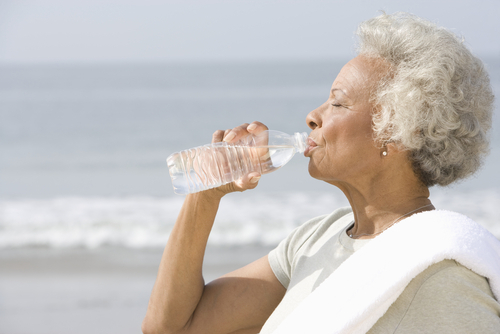 When temperatures are soaring outside, it’s critical you drink enough water to prevent your body from overheating. In addition to before and after your workout, you will want to drink eight ounces of water every 20 minutes or so to ensure you stay properly hydrated. Do not wait until you are extremely thirsty to take a drink. Bring snacks, like fruit, to help replenish fluid and electrolytes. You may also want to reduce or eliminate your consumption of alcohol if you plan on exercising outdoors regularly, as this kind of beverage tends to promote body fluid loss. Avoid midday sun or whenever the hottest part of your day may be when exercising in summer hot weather. Aim for early morning or the evening instead, when temperatures are cooler. When possible, find shady areas to incorporate into your workout route. 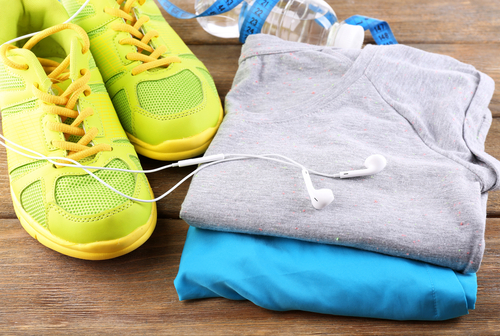 Skip dark colors of clothing when exercising outside, and avoid form-fitting clothes; they will tend to trap moisture and heat inside your body. Instead, wear white or light colors, and make sure they fit you loosely and comfortably. In this way, the air can circulate across your body, keeping you cooler and drier. Some clothing manufacturers now produce sun protective clothing, which may be an option worth considering. Finally, don’t forget a wide-brimmed hat to help keep the sun off your face and shoulders. Wearing sunscreen is critical for exercising outdoors; when your skin gets burned, it diminishes your body’s natural ability to keep cool. Sunscreen protects your skin from this harmful effect of the sun and also reduces your chances of developing skin cancer. Choose a broad spectrum sunscreen between 30 and 50 SPF that protects against both UVA and UVB rays. 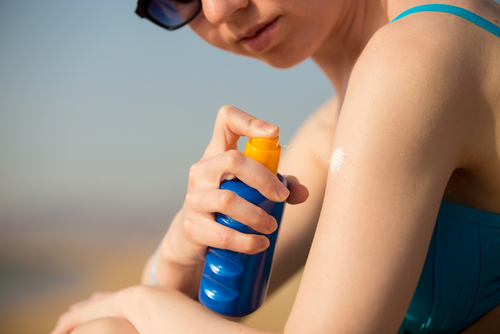 If you are wearing a sleeveless shirt or tank top, double-check coverage on the back of your neck and your shoulders. 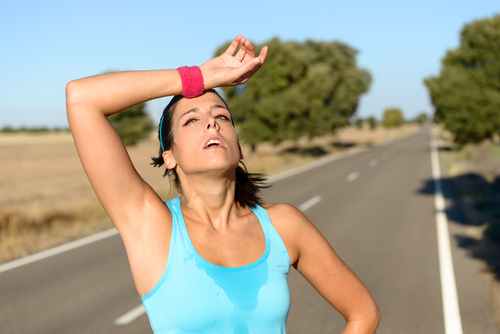 If you find yourself experiencing any of these symptoms during your workout, it’s time to stop and seek air conditioning as quickly as possible. After finding a safe, cool place, remove extra clothing and any equipment from your body. Wet yourself down with cool water by placing ice packs or wet towels across your body. 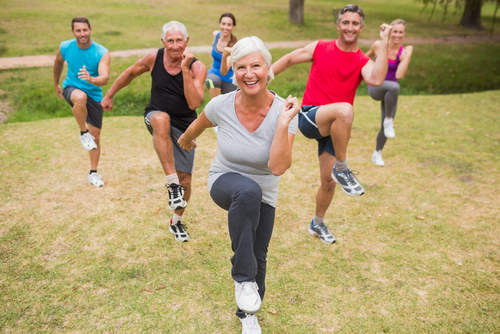 Most of us are aware of the impact that the summer heat can have on our bodies, but this can be easy to forget when you’re first starting to include outdoor exercise in our workout routine. Please take it easy; this is especially true for those who are fairly new to working out regularly. If you tend to run or jog while outdoors, consider starting at a much slower pace at first. Even seasoned exercisers may find themselves really surprised at the difference a few degrees of temperature can make on a workout. If you’re insistent on getting your workout in today, that’s fine—just don’t insist on making it an outdoor workout. 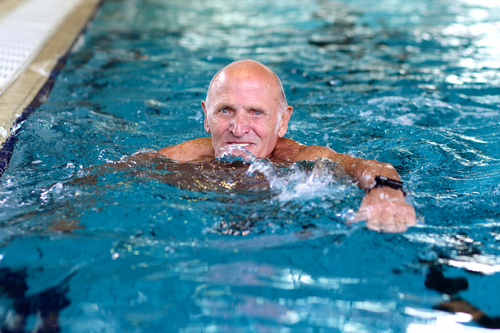 If the heat has gotten too unbearable, you have options: hit the gym, find a suitable room in your house to exercise, or visit a local swimming pool. Flexibility is key when it comes to incorporating hot weather exercise into your regimen. Overall, it’s far better to exercise several times per week every week, rather than forcing yourself through one long and grueling workout that may take several days from which to recover. Consistent exercising over the long haul, even for shorter time durations, is far more beneficial. The benefits of exercising outside in summer can be amazing. So long as you take proper precautions, pay attention to your body, and have a backup plan, you are well on your way. Enjoy the outdoors—safely!